in tan (two copies) with Battle Gear Accessory Pack #1, released in 1983.
in tan (six copies) with the Rapid Deployment Force, offered by mail in 1993.
in brown (two copies) with Battle Gear Accessory Pack #2, released in 1984.
in brown (two copies) with Battle Gear Accessory Pack #5, released in 1987.
in brown (two copies) with Cobra Gear Accessory Pack #6, released in 1988.
in grey (two copies) with the Missile Defense Unit, released in 1984 and reissued by mail in later years. in black (two copies) with the Machine Gun Defense Unit, released in 1984 and reissued by mail in later years. in black with Grunt, the missile launcher version on the 1991 Wave 2 single card. in black with Snake Eyes, the missile launcher version on the 1991 Wave 2 single card. in black with Mercer, the bearded version on the 1991 Wave 2 single card. in black with Cobra B.A.T., the 2.0 missile launcher version on the 1991 Wave 2 single card. in black with Cobra Commander, the glider version on the 1991 Wave 2 single card. in black with Toxo-Viper, the Eco-Warriors version on the 1991 single card. in black with Sludge Viper, on the 1991 single card. in black with Zap, the Super Sonic Fighters version on the 1991 single card. in black with Major Bludd, the Super Sonic Fighters version on the 1991 single card. in black with Road Pig, the Super Sonic Fighters version on the 1991 single card. in black with General Hawk, the Battle Commanders version on the 1992 single card. in black with Overkill, the Battle Commanders version on the 1992 single card. in black with Duke, the missile station version on the 1992 Wave 1 single card. in black with Wet-Suit, the yellow version on the 1992 Wave 1 single card. in black with Flak-Viper, the blue version on the 1992 Wave 1 single card. in black with Storm Shadow, on the 1992 Ninja Force card. in black with Dojo, on the 1992 Ninja Force card. in black with T'Jbang, on the 1992 Ninja Force card. in black with Dice, on the 1992 Ninja Force card. in black with Barricade, the blue version on the 1992 Wave 2 single card. in black with Wild Bill, the black-pants version on the 1992 Wave 2 single card as well as his reissue on 1993 Battle Corps card. in black with Firefly, the grey pads version on the 1992 Wave 2 single card. in black with Eel, the blue version on the 1992 Wave 2 single card. in black with Bullet-Proof, the original version on the 1992 Drug Elimination Force card. in black with Cutter, the D.E.F. version on the 1992 single card. in black with Headman, the black version on the 1992 single card. in black with Barbecue, the Eco-Warriors version on the 1992 single card. in black with Toxo-Zombie, on the 1992 Eco-Warriors card. in black with Wet-Suit, the orange version on the 1993 Battle Corps card. in black with Flak-Viper, the orange version on the 1993 Battle Corps card. in black with Barricade, the orange version on the 1993 Battle Corps card. in black with Wild Bill, the white-pants version on the 1993 Battle Corps card. in black with Bullet-Proof, the neon version on the 1993 Battle Corps card. in black with Budo, the blue version in the 1993 International Action Force mail-order set. 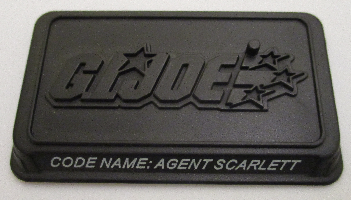 in black with Spirit, the red version in the 1993 International Action Force mail-order set. in black with Deep Six, the yellow version offered by mail in 1993.
in black with Stalker, the muddy-legs version in the 1993 Arctic Commandos mail-order set. in black with Dee-Jay, in the 1993 Arctic Commandos mail-order set. in black with Major Altitude, the blue version offered by mail in 1993.
in black with Interrogator, the purple version offered by mail in 1993.
in black with Create-a-Cobra, offered by mail in 1993.
in black with Ace, the grey version with the Conquest X-30 released in 1998.
in black with Heavy Duty, the brown-vest version with the MOBAT released in 1998 and reissued in 2000.
in black with Storm Shadow, in the 2000 Real American Hero Collection two-pack with Snake Eyes. in black with General Tomahawk, in the 2000 Real American Hero Collection two-pack with Dial Tone. in black with Firefly, the brown version in the 2000 Real American Hero Collection two-pack with Undertow. in black with Duke, in the 2000 Real American Hero Collection two-pack with Side Track. in black with Double Blast, in the 2001 Real American Force Collection two-pack with Crossfire. in black with Wet-Suit, the grey version in the 2001 Real American Hero Collection two-pack with Wet Down. in black with Shadow Viper, in the 2001 Real American Hero Collection two-pack with Zartan. in black with Cobra B.A.T., in the 2003 Internet-exclusive B.A.T. Builder six-pack. in black with Inferno B.A.T., in the 2003 Internet-exclusive B.A.T. Builder six-pack. in black with Gallows, in the 2006 Plague Troopers vs. Steel Brigade six-pack. in dark green (two copies) with the Mortar Defense Unit, released in 1984 and reissued by mail in later years. in dark green (two copies) with Battle Gear Accessory Pack #3, released in 1985.
in green (two copies) with the Ammo Dump Unit, released in 1985 and reissued by mail in later years. in dark blue (two copies) with the Rifle Range Unit, released in 1985 and reissued by mail in later years. in off-white (two copies) with Cobra Gear Accessory Pack #4, released in 1986.
in bright white with Snow Storm, the orange version on the 1993 Battle Corps card. in bright white with Snow Storm, the blue version on the 1993 Battle Corps card. in bright white with Bushido, on the 1993 Ninja Force card. in yellow with Alley Viper, the yellow version on the 1993 Battle Corps card. in red with Cobra Viper, one each for all six figures in the 2006 Viper Pit six-pack. in light grey with Shock Viper, the blue version in the 2002 Real American Hero Collection two-pack with Serpentor. in clear with Lieutenant Falcon, the jungle camo version in the 2003 Operation: Anaconda convention set. in clear with Lady Jaye, the jungle camo version in the 2003 Operation: Anaconda convention set. in clear with Major Storm, the jungle camo version in the 2003 Operation: Anaconda convention set. in clear with Cobra Commander, in the 2003 Operation: Anaconda convention set. in clear with Swamp-Viper, in the 2003 Operation: Anaconda convention set. in clear with Black Dragon, in the 2003 Operation: Anaconda convention set. in clear with Black Dragon Trooper, in the 2003 Operation: Anaconda convention set. in clear with Firefly, the Black Dragon version released in the 2003 Firefly convention two-pack. in clear with Firefly, the Tiger Force version released in the 2003 Firefly convention two-pack. in clear with Beachhead, the Tiger Force version in the 2004 Dreadnok Rampage convention set. in clear with Hardtop, the Tiger Force version in the 2004 Dreadnok Rampage convention set. in clear with Mutt, the Tiger Force version in the 2004 Dreadnok Rampage convention set. in clear with Dreadnok Buzzer, the red version in the 2004 Dreadnok Rampage convention set. in clear with Dreadnok Ripper, the red vintage-style version in the 2004 Dreadnok Rampage convention set. in clear with Dreadhead Cletus, in the 2004 Dreadnok Rampage convention set. in clear with Dreadhead Otis, in the 2004 Dreadnok Rampage convention set. in clear with Dreadnok Road Pig, the grey version in the 2004 Dreadnok Rampage convention set. in clear with Dreadnok Zarana, the grey version in the 2004 Dreadnok Rampage convention set. in clear with Dreadhead Billy-Bob, in the 2004 Dreadnok Rampage convention set. in clear with Dreadhead Joe-Bob, in the 2004 Dreadnok Rampage convention set. in clear with Dreadnok Crusher, in the 2004 Dreadnok Rampage convention set. in clear with Dreadnok Demolishor, in the 2004 Dreadnok Rampage convention set. in clear with Dreadhead Roscoe, in the 2004 Dreadnok Rampage convention set. in clear with Dreadhead Vance, in the 2004 Dreadnok Rampage convention set. in clear with Zartan, the mid-transformation version in the 2004 Zartan convention three-pack. in clear with Zartan, the Hawk disguise version in the 2004 Zartan convention three-pack. in clear with Dreadnok Zanzibar, the blue version in the 2004 Dreadnok Drivers convention two-pack with Dreadnok Thrasher. in clear with Dreadnok Thrasher, the red version in the 2004 Dreadnok Drivers convention two-pack with Dreadnok Zanzibar. in clear with Jungle Viper, the darker 2005 G.I. Joe Collector's Club annual exclusive figure. in clear with Destro, in the 2005 General Mayhem: M.A.R.S. Invades! convention set. in clear with General Mayhem, in the 2005 General Mayhem: M.A.R.S. Invades! convention set. in clear with Metal-Head, in the 2005 General Mayhem: M.A.R.S. Invades! convention set. in clear with Iron Anvil, in the 2005 General Mayhem: M.A.R.S. Invades! convention set. in clear with Iron Grenadier, in the 2005 General Mayhem: M.A.R.S. Invades! convention set. in clear with Gung-Ho, in the 2005 Steel Brigade convention three-pack. in clear with Dragonsky, in the 2005 Steel Brigade convention three-pack. in clear with Steel Brigade Commander, in the 2005 Steel Brigade convention three-pack. in clear with Steel Brigade Paratrooper, released at the 2005 G.I. Joe convention. in clear with Nullifier, the red 2006 G.I. Joe Collector's Club annual exclusive figure. in clear with Cobra Mortal, in the 2006 Cobra's Most Wanted: Mercenaries! convention set. in clear with Major Bludd, in the 2006 Cobra's Most Wanted: Mercenaries! convention set. in clear with Skull Squad Trooper, in the 2006 Cobra's Most Wanted: Mercenaries! convention set. in clear with Overlord, the green version in the 2006 Cobra's Most Wanted: Mercenaries! convention set. in clear with Coil Trooper, in the 2006 Cobra's Most Wanted: Mercenaries! convention set. in clear with Mercer, in the 2006 Slaughter's Marauders convention three-pack. in clear with Red Dog, in the 2006 Slaughter's Marauders convention three-pack. in clear with Taurus, in the 2006 Slaughter's Marauders convention three-pack. in clear with Sergeant Slaughter, the tan version released at the 2006 G.I. Joe convention. in clear with Nullifier, the blue version released at the 2006 G.I. Joe convention. in clear with Chuckles, the sleeveless version in the 2007 Flaming M.O.T.H. two-pack with Shipwreck. in clear with Shipwreck, in the 2007 Flaming M.O.T.H. two-pack with Chuckles. in clear with Copperhead, the 2007 G.I. Joe Collector's Club annual exclusive figure. in clear with Sparks, in the 2007 Tanks for the Memories convention set. in clear with G.I. Joe Doc, in the 2007 Tanks for the Memories convention set. in clear with Clutch, in the 2007 Tanks for the Memories convention set. in clear with Sergeant Flash, in the 2007 Tanks for the Memories convention set. in clear with Zap, in the 2007 Tanks for the Memories convention set. in clear with Grunt, in the 2007 Tanks for the Memories convention set. in clear with Rock 'n Roll, in the 2007 Tanks for the Memories convention set. in clear with Lieutenant Clay Moore, in the 2007 Tanks for the Memories convention set. in clear with Night Stalkers Commander, in the 2007 Tanks for the Memories convention set. in clear with Night Stalkers Shock Troops, one each for all three versions in the 2007 Tanks for the Memories convention set. in clear with Grand Slam, in the 2007 Jet Pack Troopers convention 2-pack with Grand Slam. in clear with Starduster, in the 2007 Jet Pack Troopers convention 2-pack with Grand Slam. in clear with Steeler, the brown version released at the 2007 G.I. Joe convention. in clear with Rip It, released at the 2007 G.I. Joe convention. in clear with Rowdy Roddy Piper, released at the 2007 G.I. Joe convention. in clear with Gristle, in the 2008 Cobra Headhunters convention set. in clear with Headhunter Stormtrooper, the green version in the 2008 Cobra Headhunters convention set. in clear with Headhunter Guard, in the 2008 Cobra Headhunters convention set. in clear with Headhunter B.A.T., in the 2008 Cobra Headhunters convention set. in clear with Shockblast, the green version in the 2008 S.W.A.T. convention three-pack. in clear with Low-Light, the green version in the 2008 S.W.A.T. convention three-pack. in clear with Headhunter Driver, released at the 2008 G.I. Joe convention. in clear with Sky B.A.T., released at the 2008 G.I. Joe convention. in clear with Hotwire, with the Claw Mech released at the 2008 G.I. Joe convention. in clear with Bullhorn, with the S.W.A.T. R.T.V. released at the 2008 G.I. Joe convention. in clear with Airtight, on the 2008 Direct-to-Consumer Wave 4 single card. in clear with Cobra Officer, on the 2008 Direct-to-Consumer Wave 4 single card. in clear with Cobra Night Viper, on the 2008 Direct-to-Consumer Wave 4 single card. in clear with Outback, on the 2008 Direct-to-Consumer Wave 4 single card. in clear with Python Copperhead, on the 2009 Direct-to-Consumer Wave 4 single card. in clear with Lieutenant Falcon, on the 2009 Direct-to-Consumer Wave 4 single card. in clear with Munitia, on the 2009 Direct-to-Consumer Wave 4 single card. in clear with Undertow, the black version the 2009 G.I. Joe Collector's Club annual exclusive figure. in neon green with Heavy Water, the neon 2004 G.I. Joe Collector's Club annual exclusive figure. in bright white with Frostbite, on the 1993 Battle Corps card. in red (six copies) with the G.I. 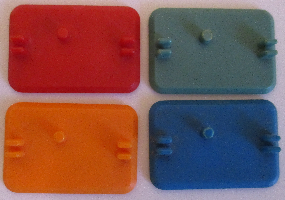 Joe Commando Attack Game, released in 1986.
in orange (six copies) with the G.I. Joe Commando Attack Game, released in 1986.
in dark green (six copies) with the G.I. Joe Commando Attack Game, released in 1986.
in blue (six copies) with the G.I. 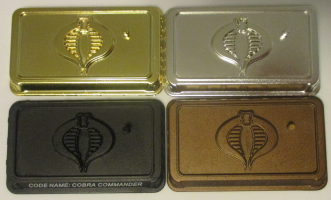 Joe Commando Attack Game, released in 1986.
in shiny gold or silver (no name) with Destro, exclusive to the 2007 San Diego Comic Convention (both gold and silver head variants). in black with Cobra Officer, the grey mask 25th-style version on the 2007 Wave 1 single card. in black with Storm Shadow, the short-sleeves 25th-style version in the 2007 25th Anniversary Cobra five-pack. in black with Serpentor, the 25th-style Devil's Due version on the 2007 Wave 2 single card. in black with Cobra, the white-symbol version on the 2007 Wave 2 single card. in black with Buzzer, the 25th-style version on the 2007 Wave 2 single card. in black with Vehicle Driver, in the 2007 Cobra Legions five-pack. in black with Storm Shadow, the short-sleeves 25th-style version reissued on the 2007 Wave 4 single card. in black with Destro, the black Iron Grenadiers version on the 2008 Wave 5 single card. in black with Storm Shadow, the comic 25th-style version in the 2008 Marvel #21 two-pack with Snake Eyes. in black with Dreadnok Torch, the black 25th-style version in the 2008 Marvel #30 two-pack with Dreadnok Ripper. in black with Dreadnok Ripper, the green 25th-style version in the 2008 Marvel #30 comic two-pack with Dreadnok Torch. in black with Cobra Commander, the light armor version on the 2008 Wave 6 single card. in black with Storm Shadow, the caped 25th-style version in the 2008 Comic #21b two-pack with Snake Eyes. in black with Tomax, the 25th-style version in the 2008 Comic #36 1/2 two-pack with Xamot. in black with Xamot, the 25th-style version in the 2008 Comic #36 1/2 two-pack with Tomax. in black with Serpentor, the no-cape version with the Armadillo Tank/Air Chariot vehicle set released in 2008.
in black with Tele-Viper, the blue 25th-style version with the RAM Cycle/Flight Pod vehicle set released in 2008.
in black with Baroness, the diver version in the 2008 The M.A.S.S. Device DVD pack. in black with Storm Shadow, the black 25th-style version on the 2008 Wave 9 single card. in black with Snow Serpent, the blue-buckle 25th-style version on the 2008 Wave 9 single card. in black with Cobra B.A.T., the green-grenade 25th-style version on the 2008 Wave 9 single card. in black with Nemesis Immortal, in the 2008 Comic #8 two-pack with Lt. Falcon. in black with Cobra Commander, the darker hood-and-cape version in the 2008 Comic #9 two-pack with Tripwire. in black with Croc Master, the 25th-style version on the 2008 Wave 10 single card. in black with Mercenary Wraith, the silver version on the 2008 Wave 10 single card. in black with Mercenary Wraith, the clear version on the 2008 Wave 10 single card. in black with Cobra Eel, the 25th-style version on the 2008 Wave 11 single card. in black with Flint, the Cobra disguise version on the 2008 Wave 11 single card. in black with Serpentor, the 25th-style cartoon version in the 2008 Arise, Serpentor, Arise! DVD pack. in black with Destro, the silver-head Iron Grenadiers version in the 2008 Ultimate Battle Pack. in black with Cobra Commander, the dark armor version in the 2008 Marvel #64 comic two-pack with Gung Ho. in black with Cobra Trooper, the mine detector version in the 2008 Desert Assault Squad seven-pack. in black with Cobra Trooper, the flamethrower version in the 2008 Desert Assault Squad seven-pack. in black with Cobra Trooper, the Hazmat version in the 2008 Desert Assault Squad seven-pack. in black with Snow Serpent Trooper, the silver-buckle heavy weapons version in the 2008 Arctic Assault Squad seven-pack. in black with Snow Serpent Officer, in the 2008 Arctic Assault Squad seven-pack. in black with Cobra Commander, the parachute version in the 2008 G.I. Joe: The Movie DVD pack. in black with Cobra Paratrooper, in the 2008 G.I. Joe: The Movie DVD pack. in black with Storm Shadow, the grey 25th-style version in the 2009 Resolute #2 comic two-pack with Tunnel Rat. in black with Python Copperhead, with the Sting Raider released in 2009.
in black with Cobra Viper, the bright-blue chrome version in the 2009 Cobra five-pack. in black with Storm Shadow, the Joe vs. Cobra-era 25th-style version in the 2009 Greatest Battles DVD pack. in black with Cobra Commander, the black Resolute version in the 2009 G.I. Joe Resolute five-pack. in black with Cobra B.A.T., the red-knee version in the 2009 G.I. Joe Resolute five-pack. in black with Air Viper Commando, with the FLAK Cannon/Cobra CLAW vehicle set released in 2009.
in flat gold with Firefly, the dark grey 25th-style version on the 2009 Hall of Heroes single card. in flat gold with Cobra B.A.T., the gold-grenade version on the 2009 Hall of Heroes single card. in flat gold with Storm Shadow, the black-belt sleeveless 25th-style version on the 2009 Hall of Heroes single card. in flat gold with Cobra Viper, the dull-blue chrome version on the 2009 Hall of Heroes single card. in flat gold with Crimson Guard, the cherry-helmet version on the 2009 Hall of Heroes single card. in black (most copies) with Storm Shadow, the 25th-style Joe version on the 2007 Wave 1 single card. in black (most copies) with Snake Eyes, the 25th-style visor version on the 2007 Wave 1 single card. in black (most copies) with Flint, the no-gloves 25th-style version on the 2007 Wave 1 single card. in black (most copies) with Lady Jaye, the cap-wearing 25th-style version on the 2007 Wave 2 single card. 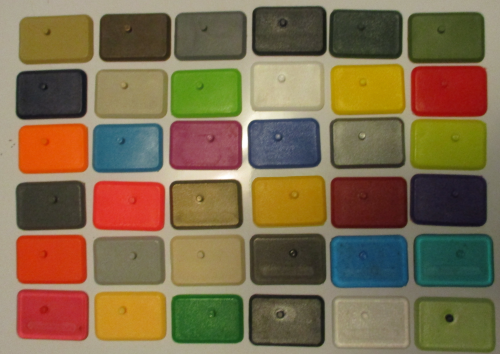 in black (most copies) with Beachhead, the olive 25th-style version on the 2007 Wave 2 single card. in black (most copies) with Shipwreck, the blue-shirt 25th-style version on the 2007 Wave 3 single card. in black (most copies) with Sergeant Stalker, the medium green 25th-style version on the 2007 Wave 3 single card as well as his rare yellow variant. in black (most copies) with Snow Job, the 25th-style version on the 2008 Wave 5 single card. in black (most copies) with Sergeant Flash, the 25th-style version on the 2008 Wave 5 single card. in black (most copies) with Snake Eyes, the flat-black 25th-style version on the 2008 Wave 5 single card. in black (most copies) with Snake Eyes, the dark blue 25th-style version in the 2008 Marvel #21 two-pack with Storm Shadow. in black with Scarlett, the comic version in the 2008 Marvel #1 two-pack with G.I. Joe Hawk. in black (most copies) with Duke, the tan comic version in the 2008 Marvel #24 two-pack with Cobra Commander. in black (most copies) with Corporal Breaker, the brown-hair 25th-style version in the 2008 Marvel #14 comic two-pack with Destro. in black (early copies) with Captain Ace, the white 25th-style version in the 2008 Marvel #115 comic two-pack with Wild Weasel. in black (early copies) with Snake Eyes, the torn 25th-style version in the 2008 Comic #21b two-pack with Storm Shadow. in black (early copies) with Wild Bill, the green 25th-style version on the 2008 Wave 7 single card. in black (late copies) with Storm Shadow, the 25th-style Joe version on the 2007 Wave 1 single card. in black (late copies) with Snake Eyes, the 25th-style visor version on the 2007 Wave 1 single card. in black (late copies) with Flint, the no-gloves 25th-style version on the 2007 Wave 1 single card. in black (late copies) with Lady Jaye, the cap-wearing 25th-style version on the 2007 Wave 2 single card. in black (late copies) with Beachhead, the olive 25th-style version on the 2007 Wave 2 single card. in black (late copies) with Shipwreck, the blue-shirt 25th-style version on the 2007 Wave 3 single card. in black (late copies) with Sergeant Stalker, the medium green 25th-style version on the 2007 Wave 3 single card as well as his rare yellow variant. in black (late copies) with Snow Job, the 25th-style version on the 2008 Wave 5 single card. in black (late copies) with Sergeant Flash, the 25th-style version on the 2008 Wave 5 single card. in black (late copies) with Snake Eyes, the flat-black 25th-style version on the 2008 Wave 5 single card. in black (late copies) with Snake Eyes, the dark blue 25th-style version in the 2008 Marvel #21 two-pack with Storm Shadow. in black (late copies) with Duke, the tan comic version in the 2008 Marvel #24 two-pack with Cobra Commander. in black (late copies) with Corporal Breaker, the brown-hair 25th-style version in the 2008 Marvel #14 comic two-pack with Destro. in black with Rock 'n Roll, the dark 25th-style version on the 2008 Wave 6 single card. in black (late copies) with Captain Ace, the white 25th-style version in the 2008 Marvel #115 comic two-pack with Wild Weasel. in black (late copies) with Snake Eyes, the torn 25th-style version in the 2008 Comic #21b two-pack with Storm Shadow. in black with G.I. Joe Doc, the 25th-style version offered by mail in 2008.
in black (late copies) with Wild Bill, the green 25th-style version on the 2008 Wave 7 single card. in black with Spirit Iron-Knife, the 25th-style version on the 2008 Wave 7 single card. in black with Snake Eyes, the crossed-swords 25th-style version on the 2008 Wave 7 single card. in black with Roadblock, the vest 25th-style version on the 2008 Wave 8 single card. in black with Flint, the Tiger Force version on the 2008 Wave 8 single card. in black with Snake Eyes, the radioactive version in the 2008 The M.A.S.S. Device DVD pack. in black with Sergeant Stalker, the yellow-green 25th-style version in the 2008 The M.A.S.S. Device DVD pack. in black with Roadblock, the light 25th-style version in the 2008 The Revenge of Cobra DVD pack. in black with Sergeant Bazooka, the 25th-style version on the 2008 Wave 9 single card. in black with Barbecue, the 25th-style version on the 2008 Wave 9 single card. in black with Tripwire, the 25th-style version in the 2008 Comic #9 two-pack with Cobra Commander. in black with Captain Ace, the green 25th-style version in the 2008 Senior Ranking Officers three-pack. in black with Wild Bill, the grey 25th-style version in the 2008 Senior Ranking Officers three-pack. in black with Skyduster, the 25th-style version in the 2008 Senior Ranking Officers three-pack. in black with Deep Six, the grey 25th-style version with the Sharc Tooth released in 2008.
in black with Leatherneck, the 25th-style version with the tan A.W.E. Striker released in 2008.
in black with Scarlett, the blue 25th-style version on the 2008 Wave 11 single card. in black with Snake Eyes, the trainee version in the 2008 Comic #10 two-pack with Hard Master. in black with Hard Master, in the 2008 Comic #10 two-pack with Snake Eyes. in black with Beachhead, the bright 25th-style version in the 2008 Comic #11 two-pack with Dataframe. in black with Wild Bill, the cartoon 25th-style version in the 2008 Comic #12 two-pack with Scrap-Iron. in black with Short-Fuze, the 25th-style version in the 2008 Ultimate Battle Pack. in black with Tripwire, the 25th-style version on the 2008 Wave 12 single card. in black with Deep Six, the silver 25th-style version in the 2008 Marvel #25 comic two-pack with Rock 'n Roll. in black with Rock 'n Roll, the light 25th-style version in the 2008 Marvel #25 comic two-pack with Deep Six. in black with Blowtorch, the 25th-style version on the 2009 Wave 13 single card. in black with Shockblast, the 25th-style version in the 2009 Resolute #1 comic two-pack with Destro. in flat ggold with Snake Eyes, the dark-bandolier visor version on the 2009 Hall of Heroes single card. in flat ggold with Beachhead, the dark green 25th-style version on the 2009 Hall of Heroes single card. in flat ggold with Flint, the dirty-boots 25th-style version on the 2009 Hall of Heroes single card. in flat gold with Snake Eyes, the glossy-black 25th-style version on the 2009 Hall of Heroes single card. in flat gold with Zartan, the dark-pants 25th-style version on the 2009 Hall of Heroes single card.